Removed by original poster on 09/02/18 - 01:38:56 (GMT). I'm in, either the Dragon Opel Blitz, or the MiniArt Gaz bus. I think I already know the answer to this question, but would Takom's V-2 with Meillerwagen and Hanomag SS100 fit in this campaign? Would a m-29C weasel hauling supplies to a drop of point to American troops in Germany be ok for this campaign? If so I have a brain storm going for a dio. I'm pretty not sure about this one - the truck and the trailer are OK, but a rocket is... I think that is no problem if it is build in a transport (closed) position of the trailer and the rocket. Not as the picture on the boxart. If You have a picture that the M-29 is full with equipment and supplies - it is OK. In a fast search for i pics I didn't saw. Only the troops transport version. Second call for the ribbon choice. If the pics are unavailable here - go the second page. They are posted by Petbat. Good morning Marten. I dont have a pic off hand but in one of my books i have a write up of several used on a forrest trail to supply the troops because the trucks could not make it through the woods. I will try to find a pic but if not would a copy of the write up and title/author do? Bob. Martin, just got off tank encyclopedia where the m-29 is catogarised as a cargo carrier along with other various makes. Still looking for pics though. There is a difference between the M29 and M29c. The C had the front and rear floatation cells, where the M29 didn't. The 29C was mainly a personnel based vehicle but was also quite often used as an ambulance, so supporting the frontline but not actively engaging the enemy, but picking up wounded and returning them for care would fit fine. I would expect they would also be used to collect and deliver medical supplies as well. After the explanation by petbat - no any problem to build M-29 for the campaign. Great. Now i just have to figure where i put the trailer at. 1 of 2 closets and 1 of 6 storage containers. The game is afoot dear Watson. "A search of a thousand items begins with a single box"
I have just enlisted. During my army time 1985-89 I used to drive a MAN 5 to gl for 3 years and Revell Germany has a 1/35 model of that. So that's what I will build for the campaign. Time frame should suit me. And for the ribbon choice, I would also prefer No. 3, Martin. Finally dug out the old Monogram weasel. After a good bit of research i am going to go were Bob has never gone before. I will give it a shot to transform the m29C into a m29. At least its not an expensive kit so if it goes south on me the lady of the house wont chase me with her broom held high like a viking looking to take off my head. Well that will be one way to fix the hull join seams…. Actually doesn't look to be that hard a project, mostly flat panels with just the curve in the corner. It'll be interesting to see this one Bob. WOW Bob, when you said that you were going to build the Weasel I thought, "it can't be the old Monogram kit, it must be some obscure manufacturer's offering." Sure all enough ! I built this kit as a 10 year old and remembered that it didn't go well. Good Luck & have fun with it ! I hope that my modeling skills have improved since i was about 13. I found an old Zis-5 from Alan in a second-hand store while on vacation in Japan. That will be my entry when we get home. 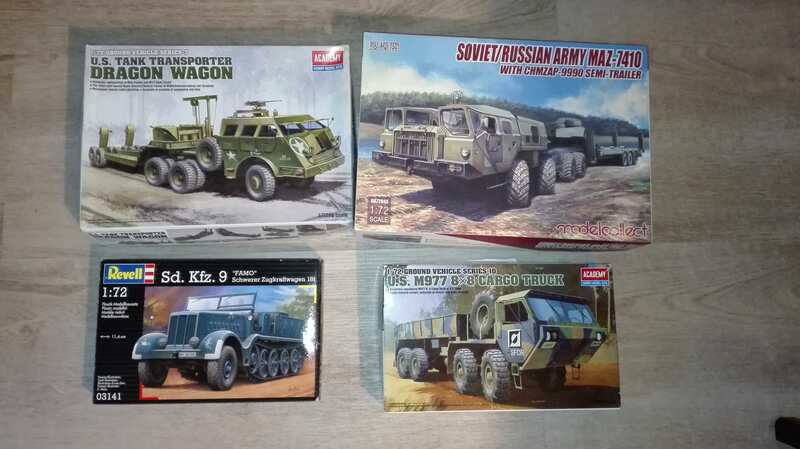 ive managed to find my modelcollect 1/72 soviet Maz7911 heavy truck so that will be my entry into this campaign.